Landmarks: the center of park is formed by low Siwalik mountain range that separates the lower part in the North/Northwest and Southeastern part. These parts are alluvial lands made up by the river banks of the Narayani-River and the Rapti-River and are well known for their spectacular sunsets. The Chitwan National Park is most likely the best Asia can offer in wildlife reservations. Alluvial, tropical river plains, dense jungles, elephant grass and an abundance of protected species like swamp crocodiles, Ghariales (endangered, crocodile species that feeds solely on fish), various monkeys, Sweetwater dolphins (in the river Ganges), Indian rhinoceros, a small herd of elephants, tiger, leopards, Himalayan black bear, Gaur (wild bovine), several endemic species of deer and more than 400 species of birds. However, what can be actually observed depends on ones patience and luck. The least dangerous way of animal watching is riding on an elephant (and that is an experience on its own). It is advisable to hire a guide for a safe visit to the park. Guided ride alongside the rivers are available that show and explain the multitude of birds and other wildlife. The rides are on motorized dug-out canoes and convey a feeling of nativeness in spite of the clattering two-stroke engine. Conlusion: The Chitwan park is a paradisiacal compensation for the mountain world that can be observed in the far distance. Every visitor of Nepal with a little more time to spend should try to see more than just the mountains, as impressive as they are. 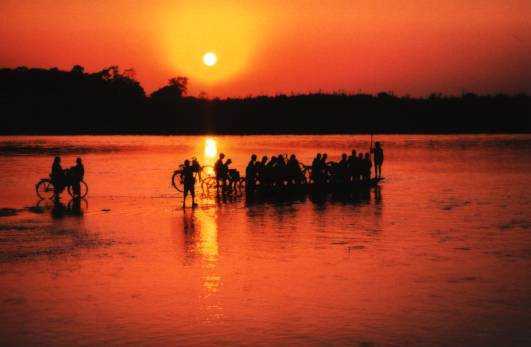 The Chitwan National Park is highly advisable and worth every minute. Accomodation: Different levels of price and quality are available. They range from the famous (250/300 US$) Tiger Lodge to beautiful but much simpler and affordable elephant grass-roofed cabins (quite clean, some come with electrical light and a simple shower) for a few Dollars. Recommendable place: Sauhara , on the banks of the picturesque Rapti-River. Time frame: Round trip Kathmandu-Chitwan in 3 days is possible, but it is more advisable to spend 4 or 5 days – every day in the national park pays!